Most cases of Diabetic ketoacidosis occur in type 1 diabetics or as a complication of type 2 diabetes. If your blood glucose levels are consistently high, you should check for ketones. 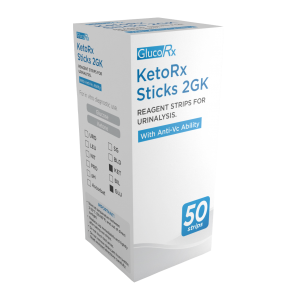 Ketones (and glucose) in the urine are easily detected by a simple urine test using KetoRx Sticks 2GK, which are available over the counter in Pharmacies and also on Prescription. A disposable alternative to the GlucoRx HCT & Ketone Diabetes Meter.